nine × = twenty seven Required Please enter the correct value. If you're heavily invested in general stocks, then gold prices have been a reprieve this week. In fact, gold is one of the best ways to hedge against the stock market's volatility. Here's the proof: Over the past month, while the S&P 500 is down 6.2%, gold prices are actually up 0.2%. 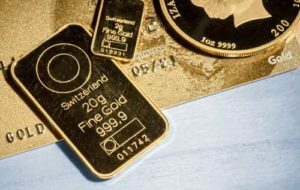 But while stocks are likely to exhibit some volatility before ultimately resuming their uptrend, gold prices may continue to pull back for longer period. If you're looking for gold prices to resume their rally, just hang in there. They're likely to be back soon. Let's take a close look at gold and the dollar's price movements over the last week. On Monday (Feb. 5), gold climbed in conjunction with the U.S. dollar. Gold opened at $1,335, hitting $1,339 by 5:00 p.m. 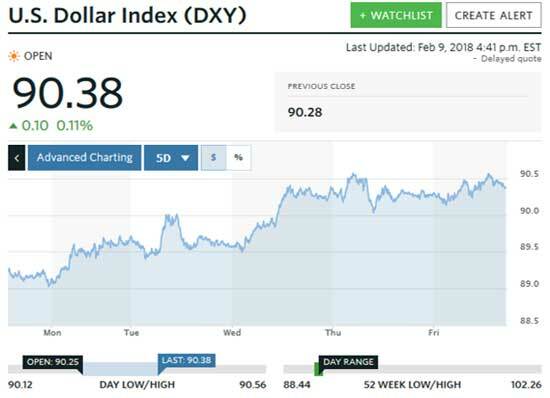 The U.S. Dollar Index (DXY) started near 89 in the very early morning and rallied to 89.5 by 10:00 a.m. From there, buyers pushed the DXY a bit higher, to 89.66 by 5 p.m.
On Tuesday (Feb. 6), bargain seekers stepped in to buy stocks "on sale," leading to the S&P managing a decent gain late in the day. The dollar saw more buying, pushing the DXY to nearly 90. However, the index backed off to 89.55 by noon and consolidated near that level for the remainder of the day. Gold opened at $1,335, then succumbed to steady selling through most of the day to reach a low of $1,322 by 4 p.m. In the last hour of NY trading, gold managed to claw back $2, to reach $1,324. Wednesday's (Feb. 7) action was mostly sideways for U.S. markets while the dollar rallied. That had the DXY back in rally mode, as investors sought the safe haven of cash. The DXY climbed to 89.87 by 8 a.m., then kept rising to about 90.25 in the second half of the day. That pushed gold lower, as some investors sold their precious metals holdings to help meet margin calls. The precious metal opened at $1,324, then bottomed around 2 p.m. at $1,313 before bouncing back slightly to close at $1,318. You can see how the DXY jumped on Wednesday in the chart below. 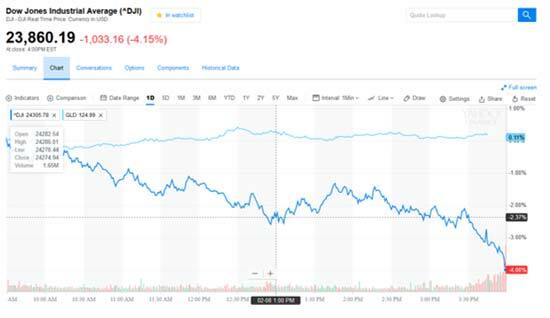 Thursday (Feb. 8) brought the second 1,000-point drop in the Dow last week. Investors looking for an alternative to volatile securities turned to the U.S. dollar and gold. While DXY managed to consolidate around 90.30 for most of the day, gold opened at $1,312 and closed higher at $1,318. As you can see in the chart below, gold remained around its opening price for the whole trading session while the Dow registered significant losses. 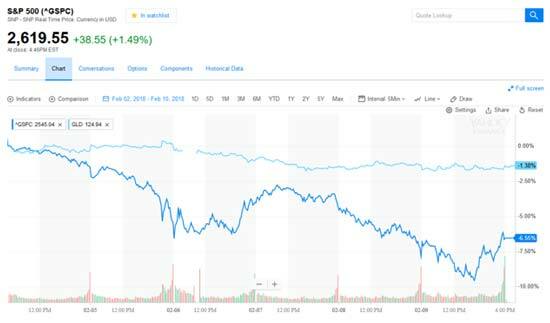 On Friday (Feb. 9), stocks paired their recent losses, producing respectable gains after seesawing for most of the day. At 8 a.m., the DXY hovered near 90.4, and gold opened at $1,316. By market close, gold had managed to stay flat at $1,316. Over the last six trading days, gold was down 1.38%, while the S&P 500 lost 6.55%, or about 4.7 times as much. 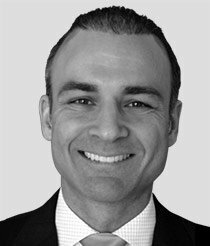 I really enjoy reading your articles but I would really like more info on silver, .see im on a fixed income and silver I can afford but not sure if I should buy or sale..seems like each time I think its hit bottom I start buying small amounts cause its the only,way I can afford to..then it goes even lower..wish I could afford gold..thanks though like I said I really appreciate you. .Terry s.
Terry, have you thought of investing in 1/10 oz bullion Gold Eagles? I'm like you, a silver junkie (pun intended) and have my share of both Walking Liberty 1 oz bullion plus old silver dimes, quarters and halves. It's what my budget allows. But, my budget also allows for much smaller denomination of gold, my favorite being the dime size 1/10 oz Gold American Eagle from any number of online dealers (APMEX being my favorite as they take credit card and lowest premiums I've seen so far). I like that this mentioned that gold is not as affected by inflation as paper money. My friend has been thinking of collecting scrap gold as a way to save up. I'll share this article with him so he can make an informed decision. Thanks for sharing!